How will this VAT increase affect property transactions? On 21 February 2018, former Minister of Finance Minister Malusi Gigaba delivered the annual budget speech. One contentious decision was revealed: the Value Added Tax (VAT) rate will change from 14% to 15%, effective 1 April 2018. This marks the first VAT increase since 1993 when we saw an increase of 4 %. Question 1. How will the rate increase work generally, for fixed property transactions? For the sale of fixed property, VAT is payable by the seller on the earlier date of when the property is registered in the name of the purchaser in the Deeds Registry, or when any payment is made in respect of consideration for the supply of such property – and the VAT rate in place at such time is applicable. Accordingly, conveyancing is not Immune to the VAT rate increase. If a "deposit" is paid and held in trust by the transferring attorney, this payment will not trigger the time of supply as it is not regarded as payment of the purchase price at that point in time. 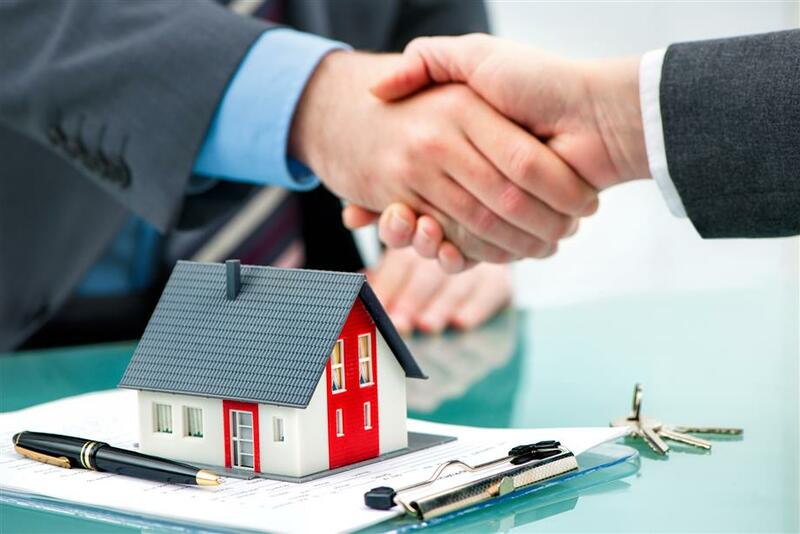 Typically, the sale price of a property is paid to the seller in full by the purchaser's bank or by the purchaser's transferring attorney. However, if the seller allows the purchaser to pay the purchase price off over a period of time, the output tax and input tax of the parties is calculated by multiplying the tax fraction at the original time of supply by the amount of each subsequent payment, as and when those payments are made. In other words, if the time of supply was triggered before 1 April 2018, your agreed payments to the seller over time will not increase because of the increase in the VAT rate on 1 April 2018. A vendor sells a commercial building and issues a tax invoice to the purchaser on 10 January 2018. If the property will only be registered in the Deeds Registry on or after 1 April 2018 and payment will be made by the purchaser’s bank or transferring attorneys on the same date, then the time of supply will only be triggered at that later date. In this case, VAT must be charged at 15% as the rate increased on 1 April 2018 which would be before the time of supply. It does not matter that an invoice or a tax invoice was issued before the time of supply and before the VAT rate increased. The tax invoice in this case would also have to be corrected as it would have indicated VAT charged at the incorrect rate of 14%. Yes, the rate specific rule provides an exception for the purchase of "residential property" or land on which a dwelling is included as part of the deal. If a written and signed agreement is concluded before 1 April 2018 for the sale of a dwelling – including a unit in sectional title and a share in a share block scheme and the construction of a new dwelling by a construction contractor - you will pay VAT based on the rate that applied before the increase on 1 April 2018 (14% and not 15%). This rate specific rule overrides the rules as discussed in Question 1, which applies for non-residential fixed property. This exception only applies to dwellings, that is buildings or structures intended for use predominately as a place of residence or adobe of natural persons. It therefore excludes commercial property regardless of when the agreement of sale was concluded, should the transfer only take place and payment is made on or after 1 April 2018, the VAT rate applicable will be 15%. However, there is still an exception to commercial properties: assuming a written sale agreement was concluded before 1 April 2018 and the purchaser makes any payment of the purchase consideration to the seller (other than a deposit to the transferring attorney) in the period from 21 February 2018 (the date of announcement of the VAT rate increase) to 31 March 2018, and the property is then registered in the name of the purchaser on or before 22 April 2018, the VAT rate of 14 % will still apply. Should the contract of sale read that a percentage commission plus VAT is payable, that will be calculated at 14% if transfer takes place before 1 April 2018 and at 15% when registration takes place on or after 1 April 2018. 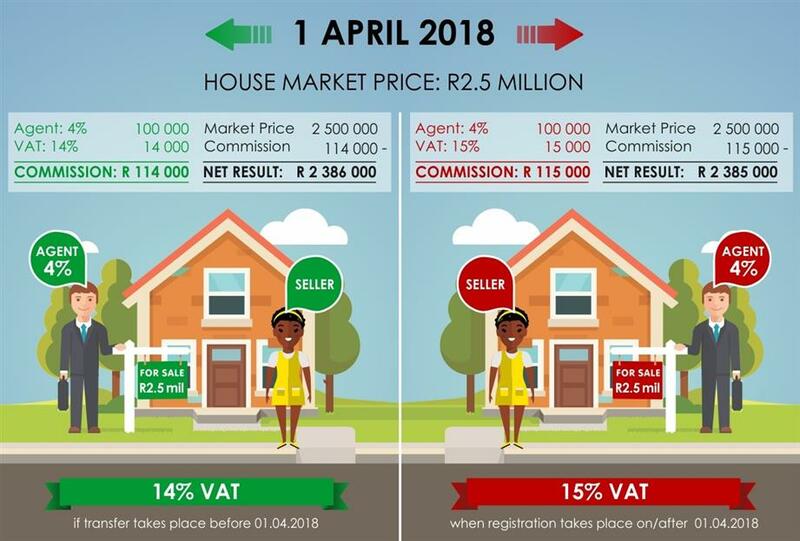 The net result is that the seller (who sold prior to 31 March 2018) will receive a lower net amount on the selling price because of the increased VAT, should transfer take place after 31 March 2018.